The speaker at the next meeting of the thriving Reepham & District Gardening Club at 7.30 pm on Tuesday 16 April in Reepham Town Hall will be Joe Whitehead, head gardener at Burghley House in Stamford, Lincolnshire, who used to work at the Salle Park Estate and is always full of useful good gardening information. This meeting is also the AGM – a necessary but painless evil, at least for us members who only have to sit, listen and second the motions. The March talk was from Lucy Skinner from Woottens of Wenhaston, Suffolk, who gave us detailed and specific information on the iris genus, one for every month. Seventy five per cent of her plants are grown on site, a fact which has made me look more closely at gardening centre stock at other venues while out garden shopping the other day. It is obvious that most garden centres buy in the majority of stock. In general terms don’t you think that plants grown locally should fare better in your own garden? She had interesting, healthy and unusual plants for sale, too. The raffle was full of excitement, as raffles always are, even though I didn’t win anything because someone gave me the “wrong” tickets. Members were also given “their” plant. This year it is Fuchsia Marbeller Flying Scotsman. The picture looks very pretty, with large pink and white blooms. 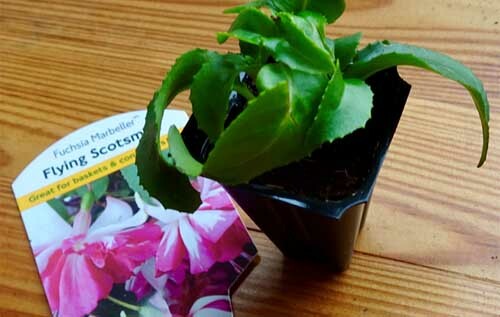 The object of this exercise is to nurture your plant – only a tiny plug plant just now – and return with the enormous and flower-covered example to the Summer Show in August with the chance of winning a prize. 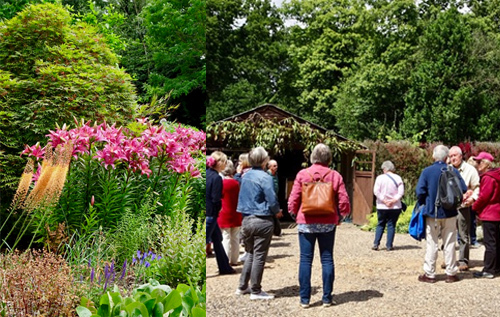 The big garden club outing was announced and it will be to RHS Garden Hyde Hall in Chelmsford, Essex, on Thursday 20 June. As you tidy your garden please keep a lookout for extras, spares, seedlings and any plant you don’t need and bring it for sale to the plant sale, which will be held on Saturday 11 May in Market Place, Reepham, from 8.30 am. Gardeners of necessity look to the future, but I wonder if those sad souls amongst you who have dishwashers at home and unfortunately might have forgotten the ancient skill of “washing up” might enjoy the opportunity to reminisce about it, while relearning this almost lost art. Come to the kitchen after any meeting and clean tea towels and free tuition can be given. 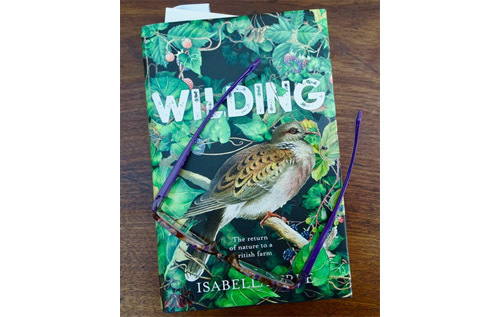 I have been reading a truly fascinating book: Wilding by Isabella Tree. If you have any interest in the whole wheel of biodiversity you really need to read this: 300 pages of beautifully written information and research challenging much of our historic, and contemporary, thinking about all land management. It is the story of Knepp, 3,500-acre estate in Sussex. Standard farming methods meant that the farms and estate were making no money because of the type of land and the state of the soil. Drastic times called for drastic measures, and the estate has now been ring-fenced and turned over to nature, with free-ranging deer, ponies, cattle and boar. A situation has been set up to allow nature to flourish – and flourish is what it is doing with astonishing vigour. The concept of “wilding” or “rewilding” means you allow nature to do what it will, allowing the natural push and pull of all life forms. This is very different from the “reserves” with which we are familiar, which are usually set up with the aim of preserving something rare, like large blue butterflies or bitterns, often at the expense of something else. There is so much to say about the processes and intelligence in this book that I cannot hope to say more here in this tiny space. Please just read the book! It is not a scolding publication, but one full of positivity and hope. I mentioned my Echinacea-growing efforts last month. I bought compost and so I know the two specks of green I see today are Echinacea seedlings, with more to follow I hope, and not chickweed, which they would have been had the compost been my own. I have not been forced to delve into the pots to see if there is any sign of the seed, to check whether it has rotted, in a similar way to a school friend who thought her sailfin mollies (tropical fish) so pretty that she kept getting them out of the water to look at their pretty scales. They died. I am turning over a new leaf: one of my New Year resolutions is to be a better gardener. In the past I have allowed my houseplants to be covered in dust, hoping that the instruction “thrives on neglect” is true, but they don’t seem to be self-dusting. Why is that? In recent years I have come to regard houseplants as a bit like animals in zoos: they are kept wrongly and therefore stunted and just about surviving, but not living well, as they would be in their proper place. Plants in the garden? Well, I reckon if they can’t look after themselves they are a dead loss, and if they die then so be it. Having said that, I did water newly planted items last summer (you might remember it was hot and dry over a long period) and my tree peony (12-years old and eight-feet tall) tore at my heartstrings when it wilted, so I relented and watered that too. The newly planted items I have just mentioned were Echinacea (pictured), bought as plug plants. This is a plant I particularly like (attractive, good for insects, long-lasting flowers), but have not had great success with, despite planting on piles of imported grit (my soil being good, but heavy-ish). I have bought at least five in the past 10 years and when I look for them, they are mysteriously absent. Researching online I find it isn’t just me; it happens to other people too. 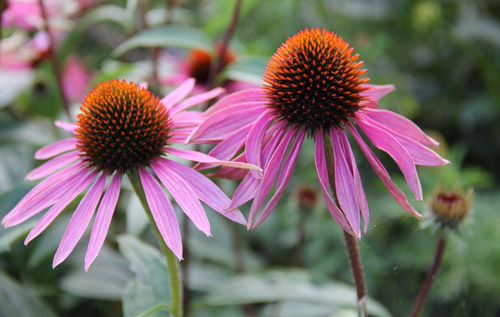 The answer is to take the category “perennial” with a pinch of salt: treat Echinacea as an annual, and if some survive and thrive another year then that is a bonus. So I have bought and planted seeds on my windowsill (turfing out the dusty, stalky poinsettia, rank hyacinths and dead amaryllis), since a good early start is necessary to get to flowering the same year. So I now resolve to water and feed all plants regularly (carefully looking after my Echinacea) and I might even try reading the instructions on the seed packets! I also have an empty – and carefully washed – Viakal spray bottle, filled with water, which emits a very fine spray to keep my indoor ferns moist and happy. I expect you know that all gardening prior to the 17th century was practical, for food production or medicinal use. It was only when shipping and trade boomed in Britain that unusual plants started to be imported, to be acquired by plant collectors and used in floral displays by “florists”. The term for a florist is specifically for their skill with flowers and was first coined in 1623. Even though garden use was primarily practical, I can’t believe that people did not go and collect “spinkies” (wild primroses which might have grown in Spinks Lane, Heydon) or wild daffodils (from Daffy Green near Shipdham) for their own gardens. Before cattle were fed mainly on corn, farmers were hugely dependent on the hay crop for them, so beasts were removed from certain meadows to allow grass to grow for hay, thereby encouraging the wildflowers we now sorely miss. And did you know that Humphry Repton spent his last seven years in a Bath chair as a result of a carriage accident, and the inconvenience of this made him realise how important wide paths and accessible vistas in a garden were for the disabled? We enjoyed the Reepham & District Gardening Club Christmas social event this month, but the quiz was difficult. Sadly, it did not require the random information given above; our team did not win. Someone put in all the wrong questions! Join us next month for a talk on History Beneath Your Feet on Tuesday 15 January at 7.45 pm in the Town Hall, Church Street, Reepham. A small veg bag pictured below from the Eves Hill Veg Co community market garden (see how fresh and luscious this is) is delivered to a secret location in Cawston, luckily just round the corner from my house, from where I fetch it every week. 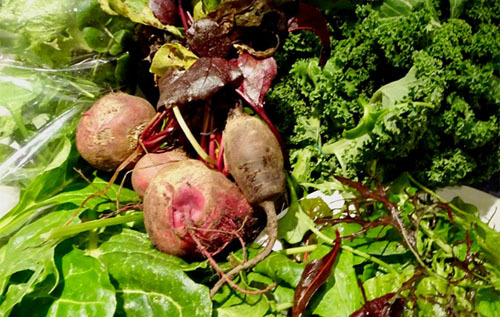 I have been using this excellent local service for at least a couple of months and have been impressed by the variety and quality of all the produce. No insect damage at all, and I know that no nasty chemicals have been used in production. I hope Spanish slugs don’t make it to Booton. I found two this year, juveniles at only three or four inches long (adults are six inches) and so sticky that you can’t just wipe the slime off. The only way to get rid of them is to hand pick and drown in a bucket of water with soap, detergent, bleach and then bury the contents 18 inches deep. They are thought to have come in on salad stuff from Spain; none of our usual strategies with slugs will work on these foreigners. All the more reason to buy locally! Look out for the eggs when clearing up the garden, as they are white rather than the translucent ones of our native slugs and snails. I wonder whether the Spanish slugs will all be repatriated at 11 pm on 29 March 2019? Do join us for the next Reepham & District Gardening Club meeting – the Christmas Party – earlier than usual, both date and time, on 11 December at 7 pm at Reepham Town Hall, Church Street, Reepham. We all bring a plate of something nice to eat, and I am already looking forward to the quiz. Yet another diverting talk was enjoyed by a large group of members and visitors to Reepham & District Gardening Club for the October meeting last night. Jim Paine from Walnut Tree Garden Nursery spoke on “Celebrating Winter”, and his message was that we should enjoy the changes the season brings. He showed us dazzling photographs of plants that give good value in terms of stem colour, bark (he cleans his Himalayan birches with a pressure washer to show off the white to best advantage, who ever said gardeners were obsessive? ), winter flowers, long-lasting fruit and interesting fragrances. However, he didn’t have a good word for conifers: What do they do? They just sit there staying the same the whole year through! Inspired by last month’s inspiring talk on saffron I bought some bulbs and planted them. They might even flower this year (they were already sprouting in the packet); if I had been quicker off the mark I would definitely get flowers this year, but I might have left it just a few crucial weeks too late. I have planted some in pots so that I can ensure the good drainage which I understand is crucial. However, our chairman told me last night that saffron doesn’t really like being in pots, so I just hope they do well. I have planted some in the open garden too, with added stones (off the drive) for drainage. 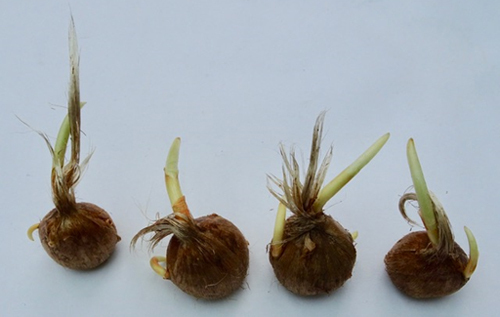 Unfortunately, I found I was digging up the snake’s head fritillary bulbs to put in the saffron, as I had forgotten what I had done last year. It occurred to me that a with digital camera or phone you could take regular pictures of the garden, which would then not just be a record, but also an aide memoire to stop digging stuff up by mistake. A dynamic talk at Reepham & District Gardening Club by Dr Sally Francis, who runs Norfolk Saffron at Burnham Norton, gave us many fascinating facts (but no cultivation secrets) about saffron. Important historically, it was used medicinally (recorded at Norwich Cathedral priory infirmary in 1461), as a spice as we know it today, and as a dyestuff. Big business locally, it was grown at a number of sites in North Norfolk, and exported from local ports to London and the Netherlands. In 1614 a ship, the John of Wells-next-the-Sea, is recorded as carrying 60 lb of saffron. You know how tiny the threads (styles) are, and remember they have been dried, so just think how much work went into gathering that crop, and the monetary value of it. 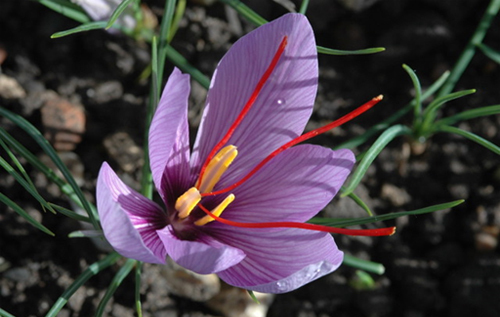 Many people grew saffron for their own use and some surplus to sell as well, and then it started to be produced on a slightly larger scale. The nature of the plant makes cultivation necessarily careful (it is a native of Crete) and harvesting hugely laborious. Every flower must be picked by hand as it becomes ready, and then taken indoors to have the valuable style removed by hand, truly a cottage industry. The blooms don’t close at night so any flower missed risks waste and spoil. As with all harvests, timing is crucial and the rows must be carefully checked every day until all are done. The tiny styles must be dried with care and then they can be handled, stored and sold as saffron hay (loose strands) or saffron cake. The economics of production and desirability of the product meant that, as with internet fraud today, there was and still is always someone trying to imitate or adulterate the product to make money. In 1358 in Nuremberg, Germany, those found guilty were either burned or buried alive. I have just thrown away the old Saffron Original on my shelf, bought in Greece in 2007 for a few cents, and now I’m checking my catalogue to buy my own Crocus sativus bulbs to ensure my personal supply. The next meeting of Reepham & District Gardening Club on 16 October will feature Jim Paine of Walnut Tree Garden Nursery, who will give a talk on “Celebrating Winter”. Meetings are held at 7.45 pm in Reepham Town Hall, Church Street, Reepham. Visitors welcome. 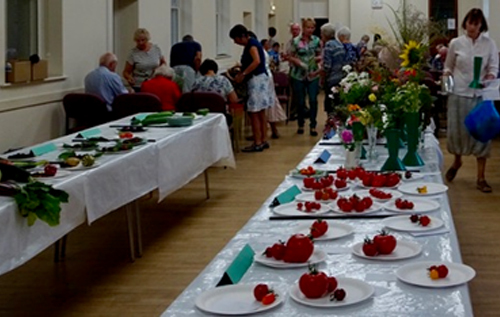 This week’s Summer Show of Reepham & District Gardening Club was a riot as always, a friendly get-together with the wonderfully democratic judging system whereby everyone chose the exhibit they thought best in each class, and then the scores were added up by the committee to establish the winner of each. But, there’s the rub, how to choose? One container of six herbs looks much like another, so in our judging are we swayed by a pretty vase, a bit of ribbon, a list of varieties, the surreptitious use of a little oasis? With vegetables, surely it must be uniformity and freedom from blemish. But how does that equate with taste? So how should I look at a plate of three potatoes? Have they been washed, should they be washed, should the scab be scraped off, should the soil be left on so that I can’t see the scab, should the variety be named? If the soil on the potato is very black (for instance), did the grower fill his trenches with black peat (where did he/she get the peat? ), because for ecological reasons we are not supposed to be using peat? 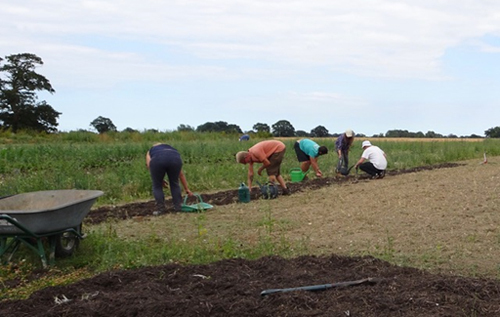 We know of course that a Gardening Club member wouldn’t have cheated by buying in potatoes from the Fens, where the soil is very black, so you see it all gets very complicated. And then we should cook the potato and everyone eat a bit to test the flavour? It’s just as well that it’s a light-hearted evening! There were two quizzes, too, one on garden plants. Would you have known why Pinks are thus named? It’s because the zigzag edges look as if cut with pinking shears. And would you know that the botanical name for autumn crocus or naked ladies is Colchicum autumnale (not a true crocus) and that it is poisonous? Coincidentally, the next Reepham & District Gardening Club talk on 18 September (7.45 pm in Reepham Town Hall, Church Street) is on Norfolk Saffron, which comes from Crocus sativus, an autumn crocus, hopefully not poisonous. 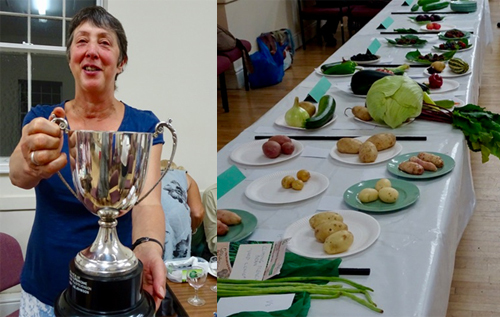 Left: Dianne Lambert, winner of the Reepham & District Gardening Club Trophy 2018. I’m thinking about dry conditions. You probably are, too. When I lived on a Greek island I planted orange and olive trees where the soil was very poor and conditions generally very dry. Once established these trees would thrive – but getting them established was difficult. So I planted the trees as deep as possible with as much water as possible, filled the hole with soil, about three quarters full, and then laid a square of plastic sheeting horizontally, about 18 inches square, with some holes in it around the tree and then filled the hole with the remaining soil. I left the soil a little lower around the tree with a small soil barrier to secure water where I wanted it. The holes in the plastic allow water through to the roots below, but the sheet stops excess water loss. The heat of the sun causes condensation on the underside of the plastic layer, so moisture then drops back down to the roots rather than evaporate into the air above. The wild mountain garrigue there, of thyme, sage and the wire-netting bush, grows from only a few inches high to perhaps two feet, so you might think these plants are young. However, when dynamite blasting of the rock has been done (to create flat areas for building) you can see the exposed roots of such small plants actually go down through fissures in the rock perhaps 20 feet in search of water and sustenance. So they are old, perhaps hundreds of years, and will cope with any drought. Perennial plants usually cope with drought better than annuals, and research is being done on the viability of perennial corn crops. What a shock to an English farmer’s system that would be! In my garden here I only water plants newly established this season and when the butts are empty I use a hose, but only trickling very slowly at ground level to soak the ground because I don’t want to compact the soil by pounding water onto it. A traditional gardeners saying is “a hoeing is as good as a watering”, which just emphasises that air is as important to plants as water. And soil quality is crucial. I was at the Eves Hill community market garden (pictured) for two days (mid-July) and there, on soil essentially pitifully poor and impacted, the constant and liberal application of green waste, courtesy of Broadland District Council and keen volunteers, opens the soil for root growth and helps to hold water where the plants need it, so that in this difficult season growth and plant health is surprisingly good. A full house of Reepham & District Gardening Club members enjoyed a “performance” by Bryan Thurlow, acting out the life of “The Perennial Mr Potter”, at the June meeting. This is the fictional story of a Suffolk lad, born in 1900, who starts life as an ordinary village boy in search of work and who ends up looking after a garden for appreciative employers. The tale was amusing, informative and evocative of a rosy and bucolic idyll. Plants were for sale and we tea-ladies found ourselves in the Market Place afterwards (after doing the washing up with a little help from our friends), clasping Salvia turkestanica, a gorgeous, really red geranium and an Abutilon, to plug any gaps in our already overfull gardens. The big gardening club trip on 21 June, organised by Celia Else, was to The Place for Plants garden and arboretum in East Bergholt, Suffolk. We then went on to Green Island Gardens in Ardleigh, Essex (pictured), where we again strolled through lovely woodland and viewed yet more plants for sale (and yes, we just happened to test the Victoria sponge, which was just as good as the first venue). The water gardens here were seething with iridescent and dazzling damselflies, and dragonflies; we even saw a grass snake in the water. The current dearth of insect life everywhere is something that constantly grieves and concerns me, so I was interested that I only saw two insects – a shield bug and a hoverfly – plus three butterflies at the East Bergholt arboretum, but many bumblebees, honey bees and a wide variety of insects at Green Island. Perhaps it was due to timing as our first visit was between 11 am 1 pm, and our second between 2 and 4 pm. Are insects late risers? Next month we learn about dry gardens on Tuesday 17 July at 7.45 pm in Reepham Town Hall, Church Street, Reepham.